Arthur David Berry was born in Arlingham on 11 September 1889 to Charles Vale Berry, a labourer, and Fanny Louisa née Goodfield. Home was a four-roomed cottage on the Priding road, and Arthur was baptised at nearby St Peter's, Framilode, on 18 October the same year. The family was a large one; Arthur was a middle child of twelve. By 1911 he had enlisted in the Army and completed his basic training. At the time of the census he was a private with the 2nd Battalion of the Oxfordshire and Buckinghamshire Light Infantry at Shorncliffe Camp, near Dover. When Arthur married Elsie May Boucher at St Mary's, Fretherne, on 8 June 1913 he was stationed at Aldershot. Their first child, Arthur, was born later that year, his birth registered in Wheatenhurst which covered the Fretherne and Frampton area. When war came, Arthur was deployed to France, arriving with his battalion on 14 August, and was rapidly in the thick of the heavy fighting at Mons and during the long retreat to the Marne; they suffered many casualties at the First Battle of Ypres, which almost destroyed the old Regular British Army. With reinforcements to replace the casualties, the battalion was later engaged in the major battles of Loos (1915) and the Somme (1916), and indeed remained on the Western Front as part of the 5th Infantry Brigade throughout the war. This would have included action to follow up the German retreat to the Hindenburg Line, the Battles of Arras and Cambrai, and the desperate fighting to stem the German 'Operation Michael' offensive in the spring of 1918. Arthur's family recall him briefly talking of horses and the Somme : like many of the war veterans, he did not speak much of his experiences for which he later earned the 1914 Star, British War Medal and Victory Medal. His war service is commemorated on the plaque in Frampton Village Hall. There must have been brief periods of leave for Charles, (known as Stewart), was born in 1916 and the birth of Hubert (Frank) was registered at the beginning of 1919. The Berrys had made their home at The Lake, Frampton, with Arthur recorded as an absent voter in 1918-19. Dorothy (Joan), Ellen (Mary), Charles (Doug), Elizabeth (Betty) and Evelyn completed the family over the next few years. Arthur worked for Cadbury's, and he and Elsie later moved to 8 Bridge Road and then to 20 The Oval. 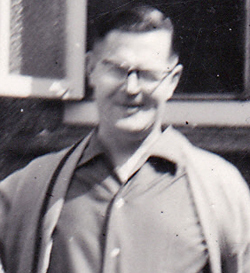 Arthur David Berry died in 1968 and was cremated at Gloucester on 1 October after a service at St Mary's.